I'm just self-learning to cook and I'm looking for a chef's knife. I've read the many differences between a chef's knife and a santoku knife, but it's still not clear to me which one I should choose. The only difference I'm aware of between santoku and a chef's knife is that santoku has exactly the same functionality as a chef's knife if one does not carve meat. I definitely want to obtain proper/efficient knife skills (referring to the rock and chop that's often discussed), but at the same time, I want something that will be easy for me to use (I tend to cut using an up and down motion). I'm pretty sure I know what length and weight I want the knife to be, but to keep the question from being too localized, I won't discuss those features. I don't know if it's worth mentioning, but I almost never carve meat or cut bones. So do I go with a gyuto, santoku, or chef's knife? The difference between a santuko and European chef's knife is mostly a matter of personal taste and style. However, if you live in North America, Europe, or anywhere else with a European cooking tradition, most of the resources and videos that you see to help you develop knife skills will assume you have a chef's knife. For this reason, I suggest you start with a good basic chef's knife. Secondly, you will want a paring knife. With these two knives, you can do 95% of kitchen tasks very well. As you develop your skills, you can try santukos and other style blades and determine if the work for you. The ultimate answer here is to try them both (cook dinner for a friend who has them both?) and go with the one that is more comfortable for you. For example, my fiancee prefers a large chef knife, I prefer the santoku. Both of us can cut just as fast, it really just comes down to personal preference and that special "how it feels in your hand" feeling. Ultimately the more comfortable (both experience and physical comfort) you are with a tool, the better you will function with it. To be honest, the "meat" thing with a chef's knife doesn't bother me that much. Usually when I am working with raw meat I prefer an incredibly sharp paring knife and a good filet knife. Cutting cooked meat, I use a slicing knife. Large meat with a bone? Either the butcher takes care of it or I use a cleaver. 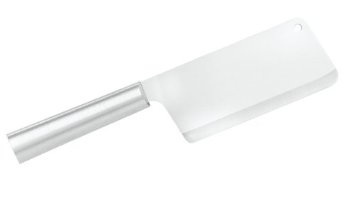 The Victorinox Fibrox 8-inch Chef's knife has been getting good reviews for years. It is sturdy, holds an edge well, and is inexpensive. It's a hybrid of a thin Japanese blade with a 15-degree edge (western knives have a 20-degree edge), but with the longer, broader blade of European knives. And at $30 it's a great choice for a first knife to start honing your skills. For new chefs, Tim Ferriss suggests a 6" meat cleaver in the book: 4-hour chef. Obviously, the other bonus is that you'd chop food very efficiently. Not having a pointy tip also makes it safer. Particularly handy for asian foods. As far as choosing specifically between chef and santoku, I find I reach for the chef knife more often than the santoku (except for cutting potatoes where santoku's divits prevent skicking). But you can't really go wrong eitherway. The most important point here is to have and keep sharp knives. They require less force to work resulting in less chance of running away and doing business with live flesh.